Weekly Wrap-Up: Wedding weekend & food from around the world! ~ Diane's Vintage Zest! Weekly Wrap-Up: Wedding weekend & food from around the world! This week was sooo busy! It was definitely a nice change from the last few weekends of virtual nothingness, but I'm pooped. Really, I'm getting old and sounding like it more and more! I had lunch with my mom, and we wanted to keep it to a certain neighborhood. Being semi-unfamiliar with the neighborhood and wanting to avoid the fast food restaurants, a quick search brought up Benley: A Vietnamese Kitchen. Seriously, our options were fast food or a modestly-priced, highly-rated restaurant in Zagat. No contest! I love the Cafe Du Monde coffee tin, which I will surely have to buy this weekend in New Orleans to recreate for myself! 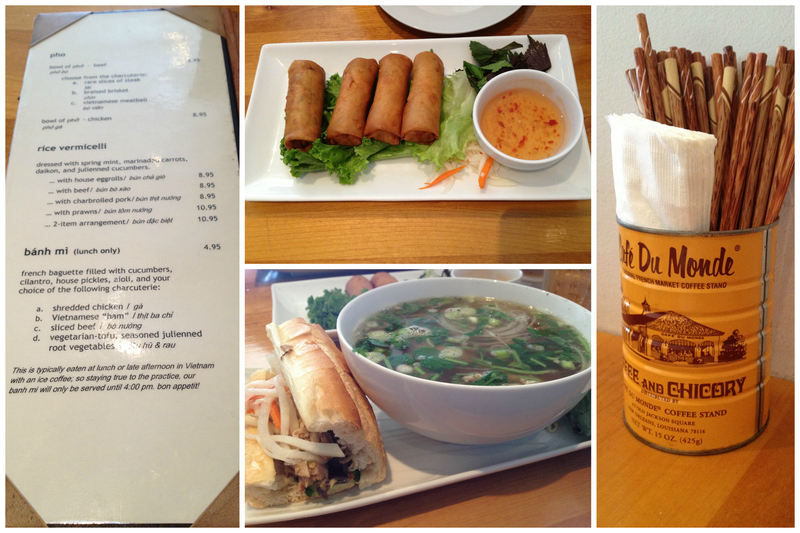 My mom ordered the rolls, while I ordered the special of a half Banh Mi and pho bowl. Both were chicken, and both were great! 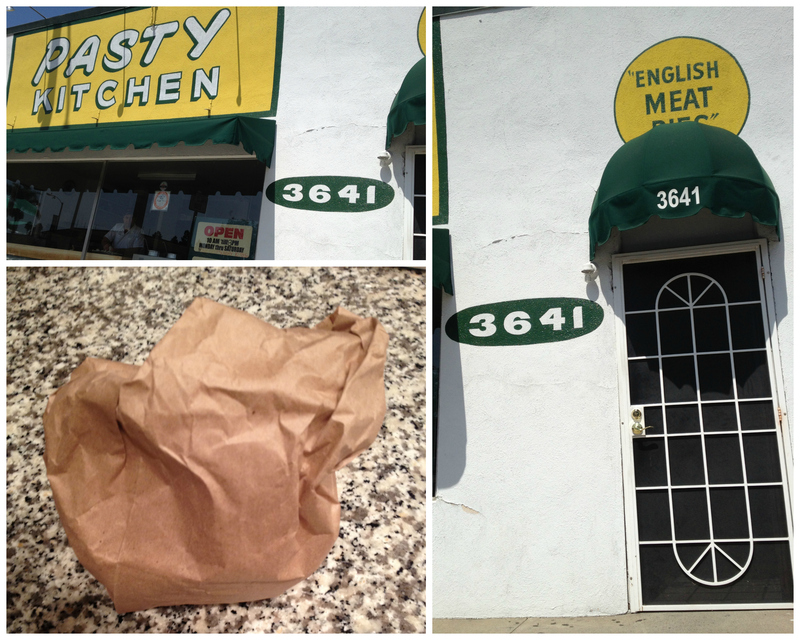 Afterwards, she wanted to pick up a couple of pasties from Pasty Kitchen. I have been eating these since I was a kid, but I haven't had one in ages! This spring when I went to London, I ate real Cornish pasties for this first time. 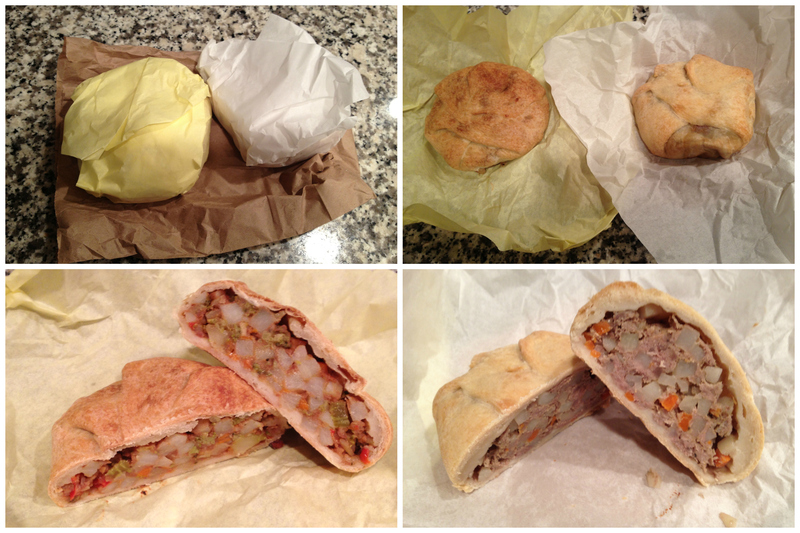 Although, they call these "English meat pies" and I love them, they're not the same as the pasties in England! I ordered a combination of Coconut Cream Pie and Orange Cream Soda. Yum! It was the rehearsal dinner for the next day's wedding, and my guy was a groomsman! After the rehearsal itself, everyone went to Antonello's, where we enjoyed a nice dinner and night of conversation. I had my long-awaited haircut and headed to the wedding! I didn't take a single photo, but I can report that I wore the blue lace dress I sewed earlier this year. Yay! Most of the day was lazy, since we got up very late after the wedding! I can report that I am 3/6 in our Pick 'Em league, ahead of my guy. Apparently, it was a crazy day of football, but I was too busy whipping up a few dishes for the next week to pay attention. Later on, we enjoyed a night of watching TV and parts of the Emmys. I love Neil Patrick Harris! We celebrated my sister's fellow coming back into town after a while away, so we went to his favorite restaurant, and an L.A. landmark, Dan Tana'S. It is absolutely tiny, and we were totally in the way while waiting for our 6 person table. My guy spotted one of the actors from Girls, but since I don't watch the show, I wasn't particularly interested. 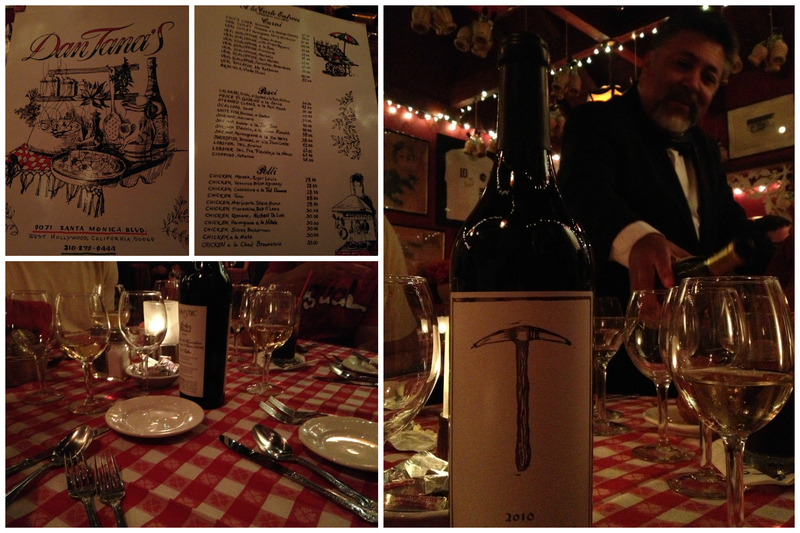 We crammed ourselves into a booth, and looked over the enormous (size-wise) menu and had the nice waiter pour wine. Honestly, the entire waitstaff is positively jolly! 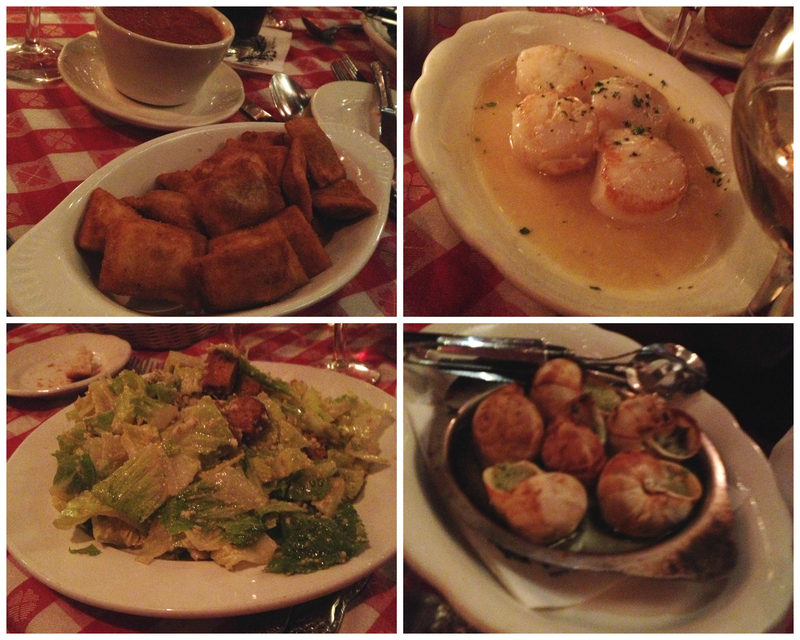 For starters, everyone ordered something different: fried ravioli, scallops, Caesar salad, and escargot. The salad is so great, with real anchovies in a perfectly balanced dressing. 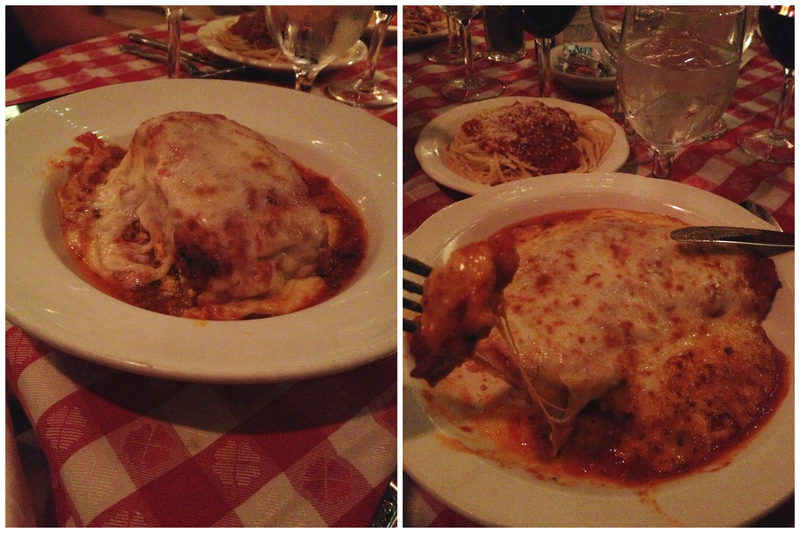 The entrees were ordered were the lasagna (left), chicken parmesan (right), shrimp parmesan, eggplant parmesan, and veal parmesan. Can you sense a theme? Honestly, we all were adamant about having our parmesans because they're amazing, but I can't wait to branch out next time! 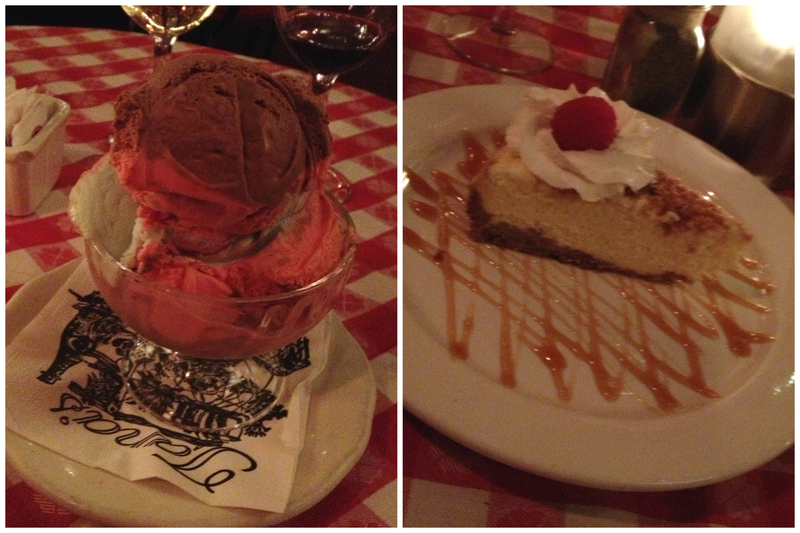 For dessert, we had Spumoni and an INCREDIBLE cheesecake. Even the cheesecake-haters of the group (yes they exist!) were in love. The filling was not too dense, but not light. Also, the crust is easily the best that I've ever had. 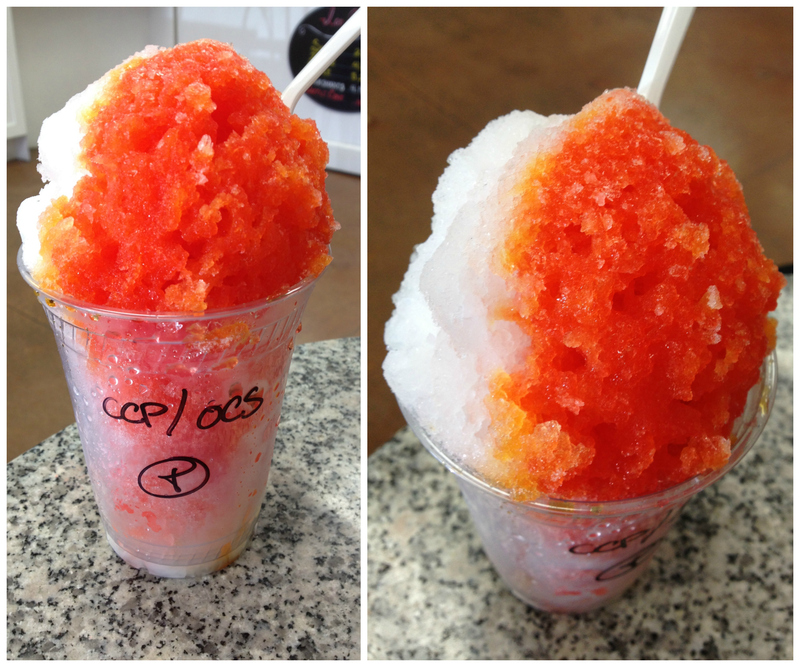 Not crumbly, not dry, and not bland. I am super happy just thinking about it!